Hello Stampers! It's time for a fun challenge over at the Tuesday Throwdown blog. This week we are being sponsored by The Cutting Cafe. I am using a beautiful stamp set called One Spring Day. This come in a line drawing or colored printables. The challenge theme is "Creative Corners." 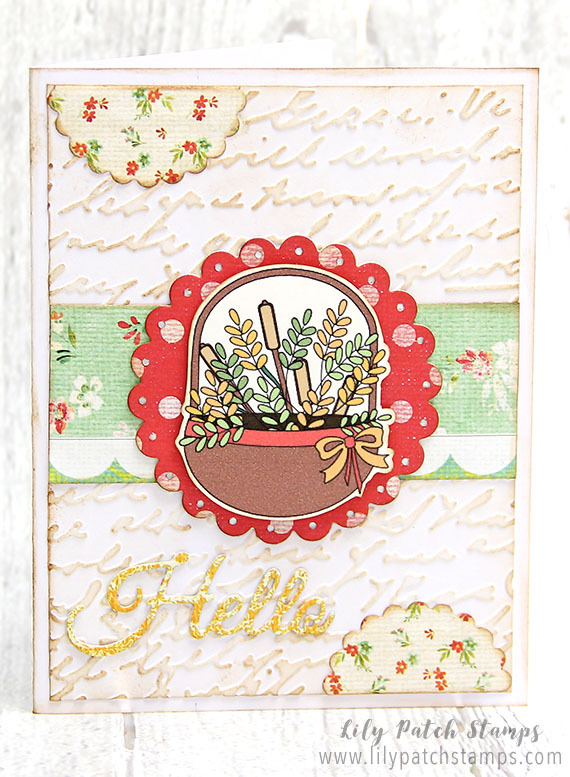 I embossed the background with a script embossing folder then die cut some scalloped circles. The smaller circle I cut in half to use to decorate two of the corners. I used Vintage Photo distressed ink to distress the embossed panel and along all the edges of the cut pieces. The die cut the sentiment but did not distress it. The flower basket was popped up using foam tape for dimension. It's time to head on over to the TT blog for more DT inspirations and play along to enter to win a fun prize from our sponsor. Papers: Strathmore Bristol white, patterned paper?